This is the BOEMIE showcase short video (6 min). You can watch a longer version (14 min) here. 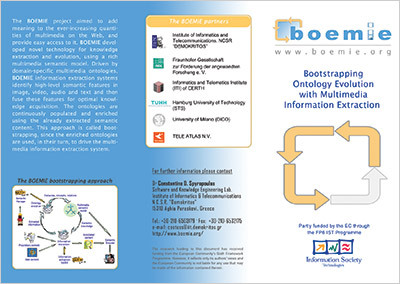 The BOEMIE project (01/03/2006 - 28/02/2009) proposed a bootstrapping approach to knowledge acquisition, which uses multimedia ontologies for fused extraction of semantics from multiple modalities, and feeds back the extracted information, aiming to automate the ontology evolution process. BOEMIE methodology BOEMIE advocates an ontology-driven multimedia content analysis (semantics extraction from images, video, text, audio/speech) through a novel synergistic method that combines multimedia extraction and ontology evolution in a bootstrapping fashion. Find out more in the BOEMIE Final Activity Report [pdf].